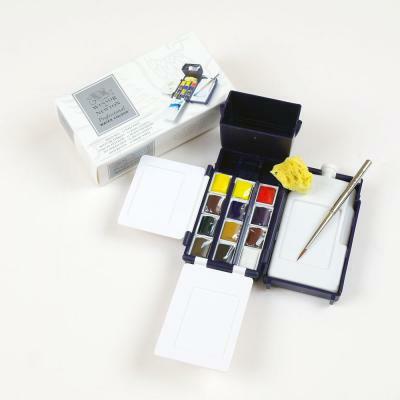 This compact and lightweight Field Box has been cleverly designed to fit snugly into the pocket while providing everything required for successful outdoor water colour painting. Constructed in durable plastic with thumb ring, the Field Box opens up to reveal 12 half pans of Professional Water Colours and a high quality Brush, Artists' Sponge, 3 mixing areas and a 35ml. capacity water bottle. I love this little box of tricks, it is so small and well thought out that it gets my thumbs up. You can easily hold your paints, water and palette in one hand while you paint away with the other. 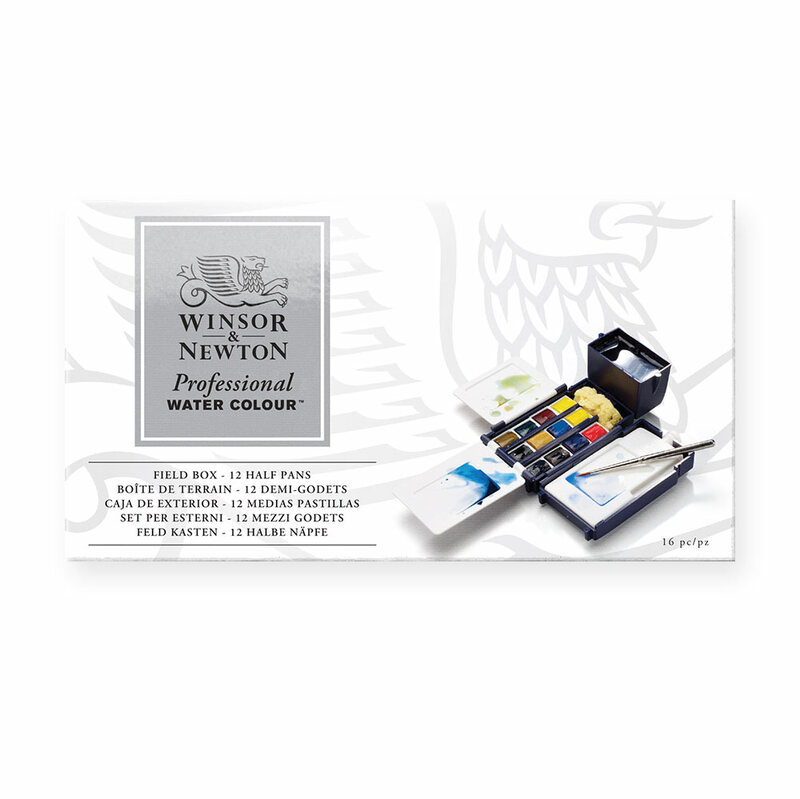 The colours are a good range too, I had a Paynes Gray, not a Chinese white by the way, a much better colour in my opinion to have in a watercolour box. I am not keen on the inclusion of black as I prefer to make my own BUT I intend to use it for nice little black and white monochromes so it won't go to waste. The tiny sponge is so useful too. If you can dispense with it though there is room for another two half pans. If you like the sponge as I do there is room enough for one more half pan, I personally added Quinacradone Magenta. The palette is limitless, you would be hard pushed to not make the colour you are after from it. The amount of water you can carry is minuscule but like the person before me said, it is doable if you are intent on packing light. If you can work in a controlled way, then this box is for you. If you need to freely slosh paint about, rinse brushes out with big hand gestures and so on, then think hard about the purchase before hand as you may need to carry more than just the box and that kind of defeats the purpose of it. I have used the "Artists' Field Box" for several years. It is ideal when you need to travel light on a sketching trip or on holiday. Using the thumb ring on the base, the box with it's water container balances nicely on my left hand and is perfectly adequate for painting watercolours up to A4 size.